519 photographs make up this 1000 pyramid quilt. 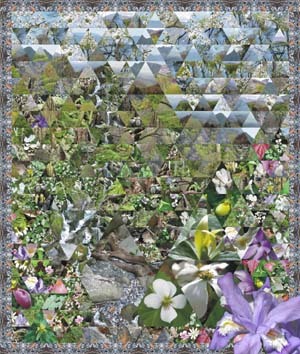 Most of the wildflowers that grow in the Smokies can be found in this quilt, including ginseng and a rare albino buckeye. I chose river rocks for the border because you cannot go far in the Smokies without encountering a river or a stream. A waterfall runs through the quilt just like they do throughout the park.